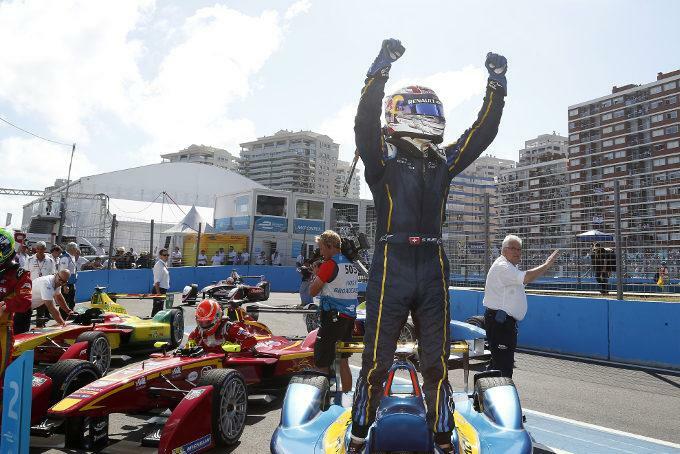 Home » Formula E: Buemi holds off Vergne to take Uruguay ePrix victory! Sebastien Buemi has taken the victory in the third round of the 2014/2015 Formula E world championship at the Punta del Este ePrix in Uruguay. The race had seen a battle largely between Buemi and Jean-Eric Vergne, who made his Formula E series debut. Vergne was all over the back of Buemi on the penultimate lap of the race, but any chance of taking the victory was cruelly snatched away after a mechanical failure forced him to pull over. Title leader Lucas di Grassi took 3rd place to continue his run of podiums. The fantastic Punta del Este circuit on the coast of Uruguay has been said by some to be ‘the Monaco of South America’ with its tight, high speeds right next to the sea. The circuit soon proved to be just as tough with multiple red flags throughout the two practice sessions. Cerruti damaged the front nose of her Trulli racing car in the first session, with series debutant Antonio Garcia putting his team China car in the wall at turn 17 in the second session. Debris on the track necessitated the final red flag. Nicolas Prost and Jaime Alguersauri topped the two sessions. The drama continued into qualifying as Sam Bird, winner of the last race in Putrajaya, locked-up into the chicane and went straight on into the tyre barrier. The man in 2nd place in the championship failed to set a time as a result and would start right near the back of the field. The star of qualifying so far this season had been Nicolas Prost, who had set the pole position time in both of the first two rounds this season. His run of pace wasn’t going to continue in Uruguay however as recently replaced Toro Rosso Formula One driver Jean-Eric Vergne, who makes his Formula E debut for Andretti Autosport in the place of Franck Montagny, put in a brilliant lap-time to take pole, 1 tenth ahead of Nelson Piquet Jr. Prost would have to settle for 3rd, just ahead of team-mate Buemi. 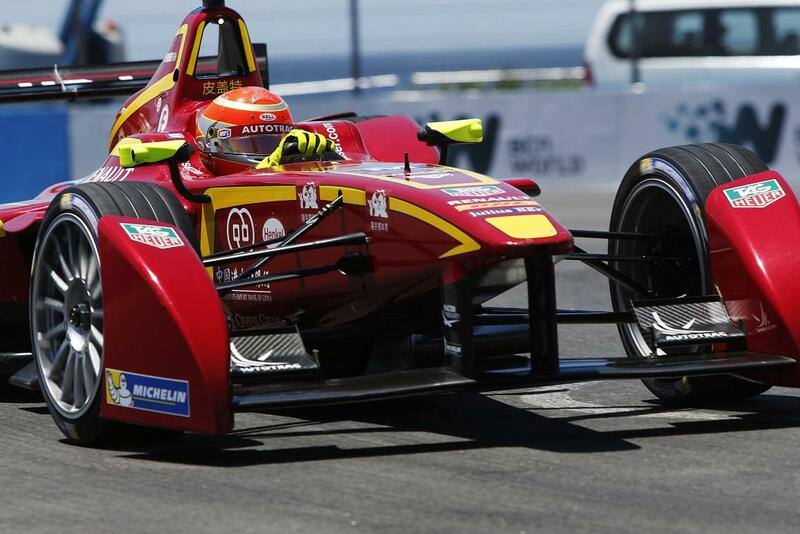 Jaime Alguersauri and championship leader Lucas di Grassi qualified 5th and 6th ahead of Jarno Trulli and Bruno Senna. Bruno’s 8th place would not stand however after being sent to the very back of the field after the Mahindra team failed to put the Michelin tyres on his car in the allotted window before the session. Jean-Eric Vergne’s Formula E debut was off to a cracking start in Uruguay, but it got even better as was one of the three victors in the FanBoost vote. Vergne, along with Nick Heidfeld and the 3rd and final series debutant Salvador Duran would each receive an extra power boost of 5 seconds per car to deploy during the race. This could be critical as overtakes could be challenging on the narrow streets. Nick Heidfeld put his FanBoost to good use as he deployed it on the start/finish straight to get by Jaime Alguersauri for 5th place. As one Virgin racing car was being demoted a place, Sam Bird was being demoted from the race. The British driver ran wide onto the high sausage kerbs of the turn 1 chicane which lifted his front wheels off of the track. He was unable to get control back of his car as he smacked into the wall and into retirement, bringing a torrid weekend to an early end for the man who had been 2nd in the championship. This bought out the safety car. The safety car came back out just 2 laps later, but soon it was back out once again. 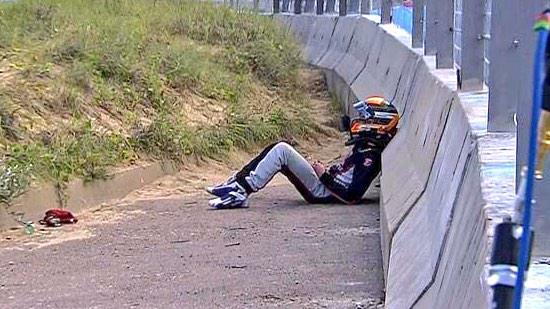 Antonio Felix da Costa missed the urn 1 chicane and then pulled off of the track with a problem. His car was unable to be moved safely, which bought out the BMW safety car again. This time it would only be out for another lap, with Piquet and Vergne leading ahead of Buemi, Prost, Heidfeld and Alguersauri. Vergne was showing brilliant pace in 2nd place but was unquestionably being held up behind Piquet. As one of the victors of the FanBoost vote, he would have been able to deploy his extra power on the long start/finish straight provided it had been working. The Frenchman was very frustrated as he pleaded with the Andretti Autosport team to fix the problem. Vergne was pushing so hard that he had a little less power left in his car than those around him. He eventually managed to get past the China racing car of Piquet into turn 5 but soon came into the pits. Vergne was just exiting the pit-lane when, unfortunately for him, the safety car was deployed. The Venturi car of Stephane Sarrazin had lost control over the kerbs at turn 15 and then been pitched further into a spin and then into the wall by Brabham. This allowed all the leading cars to pit whilst Vergne had to stick to the safety car delta lap time. 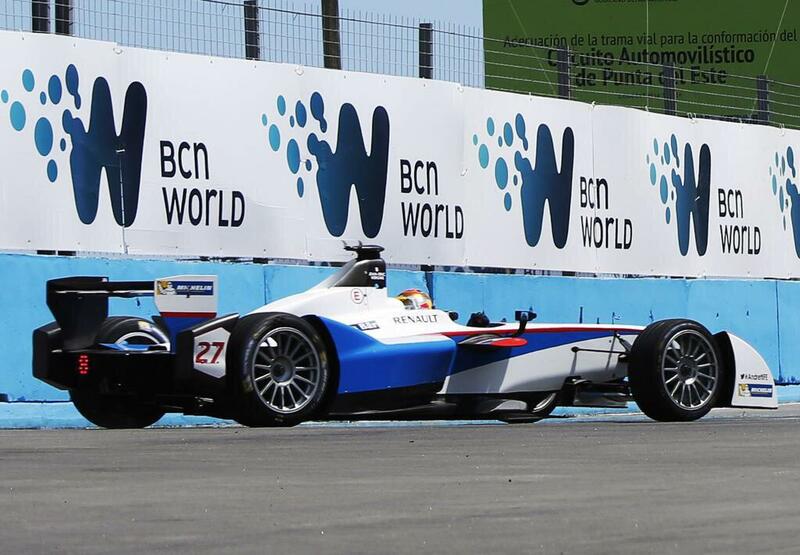 He therefore lost his lead as Heidfeld and Buemi jumped him in the stops. Heidfeld led the cars across the line to restart the race on lap 19 after a 4 lap safety car period. Buemi, Vergne, Piquet, Prost and Di Grassi completed the top 6. Heidfeld held onto the lead for the first lap of racing, but he was given a drive through penalty for exceeding the maximum power usage. He rejoined in 14th, but then received another drive through for not serving the minimum pit-stop time. Heidfeld’s penalties promoted Buemi and Vergne, two former Toro Rosso Formula One drivers, to the lead of the race with just over 10 laps remaining. A number of drivers would also receive penalties in the closing stages of the race. Michela Cerruti had been running just outside of the points in 11th place but received a drive through for speeding in the pit-lane. Nicolas Prost, who had been running in 4th place, received a penalty for exceeding power usage. Jerome d’Ambrosio was the last victim of the stewards. He had been promoted up to 5th place following Prost’s penalty, but he would receive a drive through himself which would dorp him to the lower reaches of the top 10. The battle at the front was getting closer and closer between Buemi and Vergne. Vergne had almost 10% less power left in his car as the race entered the closing stages. Despite this, Buemi had caught up to within 8 tenths of a second of the Swiss driver in the e.dams car. The gap would decrease even further after the safety car was called out for the 4th and final time. The cause of the safety car was Vergne’s team-mate Matthew Brabham. The American had been impressive throughout the race to lift himself from the rear of the field into the top 10. He had been stuck in a ‘Trulli train’ behind Jarno Trulli in 6th place when he spun over the kerbs at turn 15 and into the wall. After having hopes of a points finish taken away, the emotion was visible as Brabham threw his gloves to the floor and sat with his head in his hands in the infield. The safety car would come in with just 2 laps of racing remaining. Vergne stuck with Buemi at the restart and deployed his FanBoost, which was thankfully working on his 2nd car. He was unable to draw alongside Buemi, but the Swiss driver got loose under-braking and almost handed the lead to Vergne. Jean-Eric got right on the back of the e.dams driver as he got loose again into the next turn and straight lined the chicane. It looked as though Vergne had the pace to pass Buemi, but his hopes of taking a win on his Formula E debut were dashed into turn 17 as his car ground to a halt. Jean-Eric would not be able to complete the final lap. Vergne’s retirement allowed Buemi to edge his car home to the chequered flag. In pre-season testing Buemi had been tipped a potential champion, but had failed to get on the top step in Beijing or Putrajaya. This time at the Punta del Este circuit however, Buemi managed to claim his 1st win of the season. Nelson Piquet Jr took China Racing’s first podium of the season in 2nd place ahead of championship leader Lucas di Grassi – who has stood on the podium at every round so far. Jarno Trulli got his best finish of the season in 4th place ahead of Jaime Alguersauri. Bruno Senna completed the top 6 to finally score points after a less than ideal start to the season. At one point in the race it looked as though the Mahindra driver was in for another poor finish after massively damaging the steering in avoidance of Sarrazin’s crash, however he was able to crawl back to the pits to change cars. He made sure that the top 6 positions in the race were occupied by former Formula One drivers. Nicolas Prost and Jerome d’Ambrosio rallied back up to 6th and 7th after their late drive through penalties, with Oriol Servia and Nick Heidfeld completing the points paying positions. (P) – 3 points for pole position. (FL) – 2 points for fastest lap. Italics – FanBoost winners. Sebastien Buemi’s 1st win of the season puts him joint 2nd in the championship with Sam Bird. They remain 18 points behind championship leader Lucas di Grassi. Nicolas Prost is 4th in the standings ahead of Nelson Piquet and Jerome d’Ambrosio. Thanks to the drop round feature, Franck Montagny remains 7th in the standings despite having missed this round. Karun Chandhok is 8th, with Jaime Alguersauri and Oriol Servia completing the top 10. The next round of the season takes place in the new year on January 10th as the teams remain in South America for the Buenos Aires ePrix in Argentina.